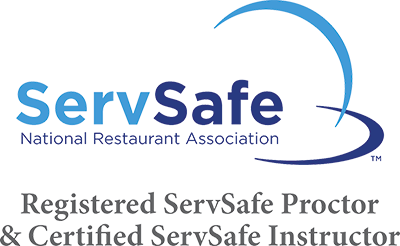 HRFoodSafe offers ServSafe® training from The National Restaurant Association Educational Foundation. We are also CP-FS certified (Certified Professional in Food Safety) by NEHA as well as certified instructors for the NEHA and NRFSP food safety training programs. All training programs meet the requirements for Food Protection Manager Certification that are required for the operation of most food service establishments. ServSafe® Food Protection classes run approximately 6 hours. Regulatory requirements may vary, be sure to review class schedule for any hour requirements for your state. The exam immediately follows the class. All training materials incorporate the latest information from the most recent FDA Food Code. ServSafe® Alcohol classes run approximately 2 hours with the exam immediately following the class. We use the ServSafe® Manager 7th Edition for all class instructions. ServSafe® Certification has been deemed valid, reliable and legally defensible, as well as transferable between jurisdictions. ServSafe® training is the right thing to do for your employees, but most importantly, for our guests! We look forward to the opportunity to serve you. LET US BRING THE CLASS TO YOU! Group of 5 or more no additional charge anywhere in New England! 10 or more anywhere in the US with no additional charge! ServSafe® Food Protection Manager Certification "Live Class"
Including class & written exam is $145 per person with the ServSafe® Managers book via Priority Mail (S&H fee apply). Written exam results are received in approximately 10 days. Certificate available immediately after receiving email from ServSafe® and may be downloaded, emailed, printed or US mail (additional charge from ServSafe® for mailing). Online exam is available following the class for an additional $20 for immediate results and certificate posted on ServSafe.com for download, email, print or US mail (additional charge from ServSafe® for mailing) . ServSafe® Food Manager "Online Course" and Online Certification "AT A LIVE CLASS"
Including class via online access and the online exam is $179. Class can be taken at your convenience from any internet connection (your system must meet specific requirements). Online course does NOT include the ServSafe Book. The exam requires a Proctor be present and attendance at any of the scheduled classes for the exam portion is necessary or at a Pearson Vue testing center. We will schedule the exam for you at Pearson Vue once location is selected. Exam Only, No Class, No Training Materials $99 The exam requires a Proctor be present and attendance at any of the scheduled classes for the exam portion is necessary or at a Pearson Vue testing center. We will schedule the exam for you at Pearson Vue once location selected. This is a comprehensive solution that delivers consistent food safety training to employees. This ensures the same food safety principles are delivered each and every time. THIS IS NOT VALID FOR FOOD PROTECTION CERTIFICATION. This is a basic training course for non-management team members and is available for an affordable $15 per person. Is available via classroom training or on the internet. The cost for the Allergen training is $10 and certificate may be downloaded immediately following online course. Live class Allergen certificate received in approximately 7 days. Is available for $15. Once course complete you will immediately download a certificate. This online course delivers critical information your employees and managers need in order to accommodate guests with food allergies. Please be sure to select the correct state before purchasing. Certain states require a specific course be completed for your training to be recognized. Choke Saver Training courses can be scheduled at our location or yours. Email us for more information. Choke Saver trained by McNeilly EMS Educators.